Honorable Eran Wickramaratne, State Minister for Finance and mass media, Mr. Ajay Sharma, Regional Head of Global Trade and Receivables Finance of the Hong Kong and Shanghai Banking Corporation Limited (HSBC), distinguished and other special guest, Past Chairman, Committee members, and members, Ladies and Gentleman, It gives me great pleasure to address you this evening at this 48th Annual General meeting Post Business session of the Sri Lanka shippers’ Council. As most of you may know this council was established way back in 1966 the year before I was even born and it has since had a rich history of 52 years. "The past year has been a phenomenal year for the Shippers' Council, as we've made great strides promoting our country. We had the opportunity to attend The Global Shippers Forum (GSF)’s annual general meetings in Las Palmas, Spain, in October last year, and in Melbourne in May this year. Both these meetings coincided with the Annual ICHCA (International Cargo Handling Agents) conference which has over 100 participants from across the globe. Further we were able to attend the Asian Shippers Alliance Meetings in Hong Kong And Macau in March this year. we have been able to strengthen our ties with the discussions we have had during these meetings with other Shippers’ councils in the region, namely Bangladesh, Thailand, Malaysia, Indonesia, Hong Kong and Macau as well as the European Shippers council. Through our interactions we have managed to cement Sri Lanka as a Shipping and Logistics Hub, in this region. I’m also proud to announce that our immediate past Chairman Mr. Sean Van Dort was appointed as the Chairman of Global Shippers’ forum at the last AGM in Melbourne. This is a great achievement and honor to the Sri Lanka Shippers’ Council and Sri Lanka. 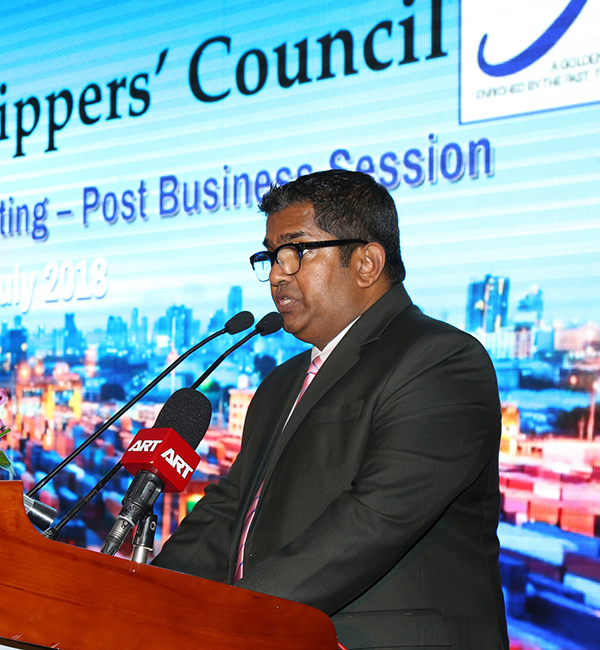 I report that the Shippers council has always fully engaged and played a pivotal role on the ongoing initiatives of the Sri Lankan government. Throughout the past year we, the private sector have invested our valuable time in discussions and planning with the Public offices such as the EDB, Sri Lanka Customs, Department of commerce and many other agencies such as Donor agencies, technical committees and their project offices to ensure the work in progress is completed in a timely manner. We urge the government of Sri Lanka that It is imperative that the ongoing projects such as The NES (National Export strategy), The National Trade facilitation Initiatives taken to establish a Trade Information Portal and the National Single window which falls in line with the WTO Trade facilitation agreement are completed and implemented, keeping to the proposed time lines if we are to gain the advantage and be in front of competition as an international trading partner We stay committed to ensure that these initiatives will see the light of day!!!!!! The current political situation is not helping us to move forward. Sri Lanka must be willing to face the facts, take stock, get the house in order and move forward We may have the best ideas and strategies to grow our exports and be successful in International trade but unless we usher in discipline, trust and respect to human life and nature, we will not have a future. My task is to bring you, to realization, and shape your understanding, that it is time that we learn from the past and make the necessary changes. We also need to observe and take note of the degradation of Human life, and values which have taken place in a subtle manner and has eroded in to the quality of life. This evening I do not want to share with you statistics or facts related to the shipping industry, which we all know, or the business challenges that lies ahead before us. but rather, open our eyes to the fact, that we are now living in a time where “Ethics and Morals “, are no longer considered virtues, whilst “Integrity and Honesty “is not important anymore and “Love and respect” to Human beings and nature, no longer exist. Due to the decline and demise of these most import attributes, People have not only lost the value and purpose of life but also the right spirit in which business should be carried out. We receive the news on radio, television, print or thru digital media each day, and more often than not, it is always Bad News. We all talk, we all complain, through social Media and chat groups, but we go back and do nothing about it. have you noticed that even the news reporters, report of what has happened, but we rarely hear about the final result where justice is done. we have almost come to terms that we have to remain helpless whilst all the injustice takes place around us. We are almost deaf to what we hear, be it corruption, abuse, violence or hate. we consider all of them to be, a part and parcel of life, and that you cannot beat them, but you could only join them or do likewise. We also must be aware that there is something called fake news! and therefore not rush to believe in everything that our ears and eyes can pick up, that is penetrated into our minds and has influenced our thinking. Time and time again we have thrashed politicians at will, standing at these podiums or other forums such as this, but nothing has changed! Because It is almost a trend these days where business leaders are helplessly running to politicians like headless chicken looking for favour and unfair advantage. But they get frustrated and complain when others do the same. If a politician agrees to tango with them, they consider him good, but if not They label him as corrupt. Through our individual short sightedness, we have traded our strength to stand together as one and hold the administrators accountable but rather we have opted to remain divided and weak in separate silos. This distorts our early learning which we have possessed through great teachers and leaders in the past who have instilled precious principles and values which we opt not to follow now, in the corporate world. We don't have a problem in obeying traffic lights as long as it is green for us. but if it is red we complain. Because we fail to understand that when it was green for us, it was Red for someone else. We all have a fare suspicion, that all policies are directed either towards fulfilling a businessman's wish list or targeted towards enhancing the popularity of the voter base. Rather than the Country's requirement which is the main reason, in my opinion, for the inconsistency we have seen in our policies. Needless to say, that this results in the lack of certainty, that is directly connected to the investors’ trust which will eventually determine the FDI that flow in to the country. The sad part in all of this is that we leave a heritage for the next generation, our children, where their minds will be shaped based on their experiences. I will share with you an example, a few months back my seventeen-year-old son wanted to apply for his driving license. So as per the normal procedure he should first go for a medical checkup. Thereafter he should sit for a test. But when I briefed him the procedure he asked me why I cannot get him the permit without having to fulfill the requirement I briefed him about he immediately told me that several of his friends have got it from the licensing authority without even having to visit them. So, I had to Explain to him the value of doing what was right rather than that which was possible. Finally, I want to share with you a true story which happened nearly 30 years ago there was a friend of mine who came for an interview. During the interview the young man was asked a question? The Interviewer told him, that if he gets the job, he may have to visit the Port to engage in various day to day functions. And in some instances, he may be asked to make some underhand payments to get the job done. After the Interview, I was told by the gentleman who held the Interview, that He did not feel that this young man was suited for the job, because he felt that he was too honest and seemed a church boy. When I conveyed this to the young Man he said that his reply was based on the fact that he was thinking that the Interviewer was trying to check on his integrity, and that if not He would have certainly said that he was willing to do it if the company was directing him to do so. The fact remains that even after 30 years we are facing the same dilemma. So, it is in our hands whether we want to pass on this culture to the next generation or make the necessary reforms now, that we can be proud to handover to the next generation where people will be proud to uphold integrity, honesty to be more valuable than profit.